We know, we know, its been awhile since our last mailbag discussion here at thebyerblog.com. Please accept our apologies and rejoice in the return of the infamous Byer of Maine Mail Bag! It is our hope that you find the information here useful as questions about our products and company arise! Now lets get to it! Question 1: What does hanging point mean? We get this question often and lots of times it can be a confusing and not a rock solid explanation so let us explain. Simply put the hanging point of a hammock is the distance between the two points where you plan to hang your hammock! The complication comes into play when a hammock description states a hanging point that may vary. For example, some of our hammocks, the woven hammocks to be specific, are handmade and tied which means that there can be a variation in length, by a whole 12 inches. The good news is as long as you have two points that are at least in the ballpark of the hanging range your hammock will be very comfortable. Length can always be added! We also have solutions for those who may not have enough length, our Madera Stand for example is a stand that only needs one fixed hanging point, like a tree, and the stand can be put where ever you need it to get the best hang for your comfort and hammock. We also recommend revisiting this old blog post, how to hang a hammock, with further hanging tips and instructions! Question 2: Can I order replacement parts? Why yes! Yes, you can! We have replacement parts for most of our line, past and present! You can order replacement parts by calling our office directly, we do not sell the replacement parts online. From cot covers down to hammock stand hardware we probably have it! A word of advice, make sure you have the measurements for your cots when you call, there are several different sizes and we need to make sure we get the correct one to you! When in doubt, about which part you need, email us a photo to comfort@byerofmaine.com and we can figure out exactly what you need! Question 3: Do you ship internationally? As of now, no. But, we are hard at work trying to find a solution! However, to our friends in Canada, please call us directly to place your order and we can ship to you! To keep up to date with the developments in shipping sign up for our newsletter so you will be the first to know! That’s it! Answers to the 3 of the most burning questions from the past few months! 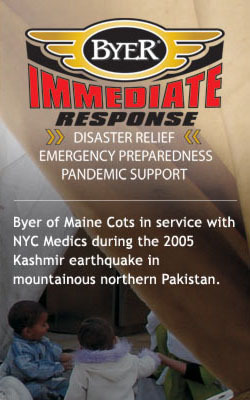 As always, please feel free to email us at comfort@byerofmaine.com with any questions, comments or concerns! The time has come to once again celebrate our most favorite piece of outdoor furniture, the Hammock. National Hammock Day has arrived!! It is just one of the 365 days that make up the year but it is by far, our most favorite. It is a day where the hammocks in our backyards can be used without the feeling guilty for putting the To Do list, that seems to be longer then your arm, to the wayside for just 15 minutes of solitude. It is a day where we can gather with our hammocking friends and see how many hammocks we can stack in between the perfect trees in the park. It is a day we can all take a moment to relax and enjoy the most comfortable beds in the World, the hammock. To continue on with a Byer of Maine traditions, here are this years best National Hammock Day events to ensure you make the most of this special day! There will be a DJ, ice cold beverages and giveaways! 8 hammocks will be given away, one every half hour and you will also have the chance to win a reservation in one of the private hammock lounges which are new the the park this year. We can’t think of a better way to spend a Friday night! Of course it wouldn’t be a proper National Hammock Day without Sway Day 2016! Hosted by the wonderful folks at the Hammock Initiative. Sway Day is a celebration of the most relaxing day of the year! Be there by 5:30 p.m to participate in breaking the regions record for most people hanging in a hammock! Buy your Sway Day tickets here. And, as a bonus, the paid ticket comes with a limited edition Hammock Initiative hat, which are really pretty awesome! They guys and gals at Hammock Initiative are creating a Sway movement around the country! Join them tomorrow! As always, an obvious choice to celebrate this day is the place you feel most relaxed, your home! Take a few minutes (or a whole lot of minutes) today to get some fresh air and relax. We give you permission! April 22, 2016 marks the 46th Earth Day!! A day to celebrate the Earth and environment. A day to do some good to make a big impact on the future of our planet. Here at Byer of Maine we are so proud of the little ways we contribute to make our carbon footprint a little bit smaller. Our Brazilian Hammocks are made traditionally in Brazil. They are handwoven and are all made from 85% recycled cotton fiber. This is one of the reasons we like to say they are “as comfortable as your favorite pair of jeans” because, quite frankly, they are! If you have never spent an afternoon in a Brazilian cotton hammock we recommend doing so immediately! Our Barbados (our signature Brazilian hammock), the Paradiso and Gigante hammocks, as well as the Brazil Hammock Chairs are not only beautiful but produced sustainably by the people of Brazil. They are beautiful additions to your corner of the planet, also known as your backyard. A few years ago we added beautiful wooden bird homes and feeders to our Byer Birding line. Our Mango Tree Collection is turned from the trunks of mango trees at a small artisanal factory near Chiangmai, Thailand. The mango trees produce fruit for 10 to 15 years and at the end of their productive lives the wood is harvested and new trees planted. The wood is repurposed into our beautiful homes and feeders. Even the wood shavings are used in the kilns to dry the turnings before finishing. That drying imparts a sweet smoky aroma that soon dissipates, but is delightful to enjoy when they are first opened for use. This unique and beautiful collection will provide an attractive addition to your home and garden and a wonderful place for the birds! We hope you take a moment today to celebrate this beautiful planet of ours and make small changes that will make a big impact on the future. Enjoy your Earth Day and take a moment to relax the Brazilian way!